History of Downtown Newhall by Arthur B. Perkins • HSSC Quarterly, December 1958. The Birth of Newhall (Cont.) • Story of Our Valley by Arthur B. Perkins, The Signal, 1-2-1947. History of Eternal Valley to 1769 (General Newhall History), 1958. Kraszynski Sues to Recover Land Used for Original Oil Refinery at Lyon's Station, 1874. Visit to Lyons Station to Check Out Oil Rumors, Los Angeles Herald, 3-28-1875. Newhall on the Move: New Townsite Under Construction News reports, 1878. Campton's Store Explodes and House Burns Down in Arson Fire, 3-3-1882. Description of Newhall Town & Pico Oil Equipment • Los Angeles Times, 9-26-1882. Severe Storms Wash Out SCV Train Tracks, Bridges • February-March 1884. Southern Hotel Burns Down, 10-23-1888 • News Reports, October 1888. George Campton Biography • Pen Pictures from the Garden of the World, 1889. Newhall and Acton Men Fight for Hydraulic Mining • News Reports, 1-1892. Newhall Oil Field Notes, Including Pico, Needham Ranch, Elsmere, Placerita Canyon • News reports, Early 1900s. Newhall Chamber of Commerce: By-laws & First-Year Minutes • Organized 2-21-1923. Hart Mansion Construction: Letter from Hart; Notes from Architect, 1926. SW1701 - "Live Oak Manor" Rock Arch Erected 1926, Relocated 1930 for Road Improvement • News reports, 1920s-30s. History of Our Lady of Perpetual Help Catholic Church • from Brunner's 1940 History. Newhall Community Hospital, Est. 1922 • From Brunner's 1940 History. Newhall Community Hospital Moves to 6th & Spruce Streets • News reports, 1926. Dr. Sarah L. Murray's Newhall Emergency Hospital, Est. 1930 • From Brunner's 1940 History. History of Newhall Ambulance Service • From Brunner's 1940 History. History of Newhall Dentistry • From Brunner's 1940 History. History of Wildwood Sanatorium (TB), Happy Valley-Newhall • From Brunner's 1940 History. Wildwood Sanatorium in the News • News reports, 1920s-1940s. Arcadia-Wayman Street Oil Boom of 1948-49; Starts in C.M. MacDougall's Backyard • News Reports, 1948-1949. Oil's Well that Ends Well: Milfred Yant's Long Con Pays Off at Confusion Hill • TIME Magazine, 12-19-1949. Disney Donates Buffalo to Hart Park Ralph Story-CBS Radio Program, 4-16-1962. Preliminary Feasibility Study: Elsmere Canyon Landfill, May 1984. 8th Street Home Popular with Vaudeville Greats by Norman & Cynthia Harris • Old Town Newhall Gazette, May-June 1998. Downtown Newhall Historic Resources Survey & Impact Analysis • City of Santa Clarita, March 2005. Old Town Newhall Specific Plan • Adopted by City Council 12-22-2005. Downtown Newhall Specific Plan: Eligible/Potentially Eligible Properties (Superseded 2012) • Draft 2005, Adopted 2007. The Story of Newhall Redevelopment, 1997-2012 • City of Santa Clarita, 2012. George Campton and His Exploding Newhall General Store by Dr. Alan Pollack, Dispatch, May-June 2016. HS9027 - Envelope, Postmarked Newhall, 1-20-1881. HS9028 - Envelope Addressed to Mrs. Ygnacio del Valle, Postmarked Newhall, 6-2-1884. AL1893 - Postcard from John F. Powell, Ordering Pilsener beer, Postmarked Newhall, 6-20-1893. LW2677 - Generic Postcard, Postmarked Newhall, 1-5-1914. LW2702 - Postal Cover: Butterfield Overland Mail Centennial 1858-1958, Newhall Participates, Postmarked 10-8-1958. Pioneer Oil Refinery: Registered Landmark No. 172 • State Parks/WPA 1936. Pioneer Oil Refinery 1876: The First Successful Refinery in California • ASME, 9-27-1975. AP2926 - Pioneer Oil Refinery, ~1880. HB1714 - Andrew's Station (1877); Andrews Plat; Pioneer Oil Refinery Layout. SW3003 - Pioneer Oil Refinery, Pre-1930 Restoration. SW3004 - Newly Restored Pioneer Oil Refinery Dedicated to D.G. Scofield, News reports, 11-5-1930. TLP3002 - Pico Oilmen at Pioneer Refinery Dedication, 11-5-1930. TLP3001 - Pico Oiler Children at Pioneer Refinery Dedication, 11-5-1930. LW2497 - Pioneer Oil Refinery, ~1930. HS7010 - Pioneer Oil Refinery & Pico Derrick Float, 1939 Pasadena Rose Parade. LW2252 - Pioneer Oil Refinery, ~1940. LW2499 - Pioneer Oil Refinery, Rear View, ~1940. AP2536 - Pioneer Oil Refinery, 2 Views, ~1940s. AP2522 - Pioneer Oil Refinery, 1950s. LW2251 - Pioneer Oil Refinery's 150-bbl Cheesebox Still, 10-1-2004. SC1316 - Pioneer Oil Refinery: Revised Master Plan, Adopted 6-11-2013. CH1601 - Photo Gallery: Original Boilers, Newhall Pioneer Oil Refinery • Chevron Richmond Refinery 2016. HB1713 - N-Scale Model of Pioneer Oil Refinery by Thomas R. Knapp AIA, 2017. HS9029 - Wiley's Windlass, 1950s (modern drawing). LW2304 - Surveyor's Map Showing Lyon's Station, 1875. AP2311 - First House at Lyon's Station. AP2306 - Toll House Below Beale's Cut, Post-1863. AP0111 - Lyon's Station? ca 1870s. SL2273 - Artist's Rendering of Newhall, 1878-80. AP0607 - Railroad Avenue, ~1879. AP0121 - 1878 Campton House, 8th & Spruce Street. AP0615 - G. Campton's General Store, ~1880. AP0616 - G. Campton's General Store, ~1880. LW2274 - Town View Showing Newhall School and Southern Hotel, 1879-1887. AP2708 - Southern Hotel, 1886. HS2003 - Stagecoach at the Southern Hotel, 1880s. HS2001 - Gifford Home, ~1880s. AP1006 - J.O. Newhall's General Store, 1880s. LW2137 - San Fernando Railroad Tunnel in Newhall, Stereo Card, ~1880s. AL1883 - Wells Fargo Letter and Envelope from Newhall to Norwalk, CA, Postmarked Newhall, 5-18-1883. AP0622 - 1884 Home of John & Sarah Gifford. SL8702 - Panoramic View of Newhall Showing Southern Hotel, ~1887. AP0403 - Railroad Avenue with Mule Teams, 1887. AP2706 - Railroad Avenue with Mule Teams (labeled), 1887. AP1012 - Commercial Fruit Drying Operation in Newhall, late 1880s. TF8801 - Sam Smith's Blacksmith Shop, 1888. AL1888 - Wells Fargo Letter and Envelope from Newhall to Norwalk, CA, Postmarked Newhall, 6-7-1888. AP2632 - Plat Map of Newhall (detail), 1889. AP3011 - St. John's Subdivision (Map), 1880s-90s. LW2736 - G. Campton's General Store, Ver. 3, R.E. Nickel Photo, ~1890. AP2310 - Alexander Hume and Family at Home in Newhall, ~1890. AP0418 - Downtown Newhall, 1890-1891. AP0602 - Newhall Train Depot, 1890s. AP0112 - Railroad Avenue Panorama, 1890s. AP0909 - Campton's General Store, 1890s. HS9011 - Powell Home on Railroad Avenue, 1889-1896.
ap1010 - Powell Home on Railroad Avenue, 1890s-1900s. HS9904 - Ed Pardee and Prize Horse, Newhall, 1890s. AP0604 - Ed Pardee's Livery Stable, 1890s. AP1528 - Livery Stable and 2nd Southern Hotel, ~1890-1900. AP1529 - Dining Room, 2nd Southern Hotel, n.d.
HS0210 - Oil Exchange Saloon, 1890s. LW2345 - Oil Exchange Saloon Tokens, circa 1890s, Unique. HS9301 - Railroad Avenue: Freighter Delivering Boiler to Pico Oil Field, 1893? MS0194 - Nick Rivera's Saloon, ~1890s. LW2347 - Nick Rivera Saloon Token, circa 1890s, Unique. LW2348 - S.P. Moore Pool Hall Token, circa 1890s, Unique. LW2349 - A. Staudy/Stauty's Pool Hall Tokens, circa 1890s, Unique. AL9201 - Billhead from G. Campton's General Store, 9-1-1892. SW9801 - San Fernando (Train) Tunnel ~1898. AL9901 - $500 Homeowners Insurance Policy FBO W.N. Forker, 6-8-1899. LC0020 - Nick Rivera's Saloon, ~1900. LC0010 - LaSalle's Meat Market, ~1900. MS0157 - Railroad Avenue, ~1900. AP1617 - Ladies Shooting, ~1900. HS9014 - John F. Powell at His Office in Newhall, 1903. US0301 - Monarch Saloon, Formerly Rivera's Saloon, ~1903. AP0105 - Gulley/Swall General Store & Meat Market, ~1904-1906. AP0119 - Interior of Campton's General Store (as Lindenfeld & Landell), 1908. AP0106 - Newhall Train Depot, 1909. AP0109 - Spruce Street, ~1909. US1010 - Woman Standing in Street (Spruce), Pardee Livery, 2nd Southern Hotel 1910. OV1001 - Entrance to San Fernando Railroad Tunnel, 1910. LW2127 - San Fernando Railroad Tunnel in Newhall, Colorized Postcard, ~1910. AP0516 - Railroad Avenue, ~1910. AP1603 - Tom Frew's Blacksmith Shop, ~1910. AP2702 - Railroad Avenue & 8th Street, Probably 1911-1912. AP2623 - Overview of Railroad Avenue, Early 1910s. LW2201 - Postcard: "Greetings from Newhall, Cal.," ~1910s. AL1911 - Postcard: "Birdseye View of Newhall, Cal.," ~1910s. AP1725 - Hanging Tree on Railroad Avenue, ~1910s. LW2223 - Pacific Coast Oil Co. Headquarters, ~1910s. AP0727 - White Star Garage, Early 1910s. L.A. Aqueduct: World's (Then-) Largest-Diameter Concrete Pipe Installed in Whitney Canyon • News reports, 1910. LW2734 - L.A. Aqueduct: Cement Mixing Plant at South End of Newhall Auto Tunnel, ~1912. LW2417 - Owens Valley Water Pipeline, ~1913. Full Movie - Harry Carey in "Broken Ways" (1913), Showing Downtown Newhall, Beale's Cut. LW2186 - Aqueduct Falls, aka The Cascades, South of Newhall, 1914. Newhall (Auto) Tunnel Opens • News reports, 12-1910. L.A. County's Road-Building Achievements: Newhall Tunnel, Mint Canyon & more • From Ben Blow's "California Highways," 1920. LW2187 - Newhall Auto Tunnel, 1914 (2 Views). AL1914 - Newhall (Auto) Tunnel, Photograph, ~1914. AP0705 - Newhall (Auto) Tunnel Traffic, ~1920s. LW2020 - Newhall (Auto) Tunnel, Color Postcard, 1920s. AL1910 - Newhall (Auto) Tunnel, Real Photo Postcard, 1920s. AL1920 - Newhall (Auto) Tunnel, South Portal, Real Photo Postcard, 1920s. AL3033 - Newhall (Auto) Tunnel, South Portal, 2-7-1926. AL2025 - Scene Near Newhall (Auto) Tunnel, Real Photo Postcard, 1920s. BA3001 - Newhall Auto Tunnel from the Air, July-August 1930. AP1527 - Newhall Auto Tunnel Cut Lines, 1938. AP1635 - Newhall Auto Tunnel Being Replaced, 1938. MJ3801 - Last of the Newhall (Auto) Tunnel, 1938. AP0832 - Highway Replaces Newhall Auto Tunnel, 1938. TS0101 - Bronze Plaques for Newhall Auto Tunnel, 2-2001. LW2867 - Auto Tour: Ford Model 'T' Touring Car in Newhall Pass ~1912 (2 Views). LW2867c - Auto Tours in Newhall Pass, 1913-1914 (2 Views). AL1916 - Newhall Grade, ~1914. GD1402 - Mayhue Grocery and Feed Store, Corner Railroad & Market, 1914-1919. AP0703 - (First) OLPH Catholic Church, 1915-1961, 3 Views. LW3373 - Wall Calendar from Albert Swall's Newhall Cash Store, 1915. TL1501 - Chicken Ranch in Happy Valley ~1915. CM2001 - Eggland Chicken Ranch, Happy Valley, 1910s-1920s. Multiple Views. RL1601 - Downtown Newhall, Postcard, Marked 1916. AP0719 - E. Chaix's Grocery Store, ~1916. AP1524 - Spruce Street, 1916. AP0704 - El-Dorado (Saloon) at Railroad & Market, ~1919. AP0505 - Early Mixville in Newhall, c. 1916-1920. JD2001 - Railroad Avenue and Market Street, Abandoned Monarch Saloon, ~1930-1932. AP1523 - Swall Hotel (Swall Block), 1920. AP0723 - Frank Lassalle's Vineyard, Wiley Canyon, 1922. GD2302 - Jesse Doty's Ford Garage (Interior), Multiple Photos, 1923. GD2304 - Jesse Doty's Ford Garage (Exterior), Multiple Photos, 1923. AP1622 - Fred R. Lamkin's Newhall Garage, 1920s. AP0724 - Tom Frew II and Back Side of Blacksmith Shop, 1920s. LW2113 - Newhall Movie Set, 1920s. AL1932 - Fremont (Newhall) Pass, ~1920s. AL1974 - Weldon Canyon, Newhall, Real Photo Postcard, ~1920s. - 90 Years Beneath the Cross: Story of First Presbyterian Church by Jerry Reynolds 1986. AP0234 - First Presbyterian Church (first structure), 1910s-20s. AP0235 - First Presbyterian Church: Building the Parsonage, 1914. AP0925 - Film Shoot at First Presbyterian Church, ~1920. LW3402 - Charlie Chaplin at First Presbyterian Church in "The Pilgrim" (1923). GR0210 - First Presbyterian Church (second structure), 1920s. LW2880 - Soledad Hotel & Coffee Shop, Today's 24325 Main St., ~1920s. AP0227 - Postcard: Views of Newhall, 1920s. AL1923 - Newhall Speed Limit Sign, Photograph, ~1920s. LW2571 - Newhall Forest Ranger Station, 1923 | Corps Marks Forest's 75th Anniversary 1967. AL3025 - Old Newhall Jail, 3-15-1925. AL3026 - Old Newhall Jail, 6-14-1925. SD0200 - Old Newhall Jail (1906-1939). Color Photo, 1960s. AP0730 - Newhall Traffic Circle, ~1926. LW2311 - Advertisement for Milleranche Development (Probably Wildwood Canyon), 4-11-1926. AP0720 - Emile Chaix's Firestone Tire and Vulcanizing Shop, 1920s. SR2601 - French Village ~1926. SR2602 - French Village ~1926. BH3901 - French Village Waitresses, Late 1930s. BH5801 - The Frontiersmen Perform for American Legion at French Village, 1956. Ted Kennedy Stumps for Brother JFK at Tex Williams' Village Nightclub, 11-2-1960. LW2984 - Tex Williams' Village Nightclub, 1962. AP1516 - American Theater, ~1940s. Text by Bill Crowl. HS5502 - Canceled Checks from American Theatre for Film Delivery, 1955-1956. HS5601 - Handbill: Kara-Kum the Magician Performs at American Theatre, 2-22-1956. Newhall Woman's Club: Favorite Recipe Book, 1963-1964. AL1928 - Newhall Parade, ~1928. FD2801 - L.A. County Fire: 1928 Soledad Division HQ, County Forestry Department, Newhall, 2 Views. FD2803 - L.A. County Fire: Forestry (Fire) Pumper & 1928 Soledad Division HQ, Newhall. FD2901 - L.A. County Fire: Asst. Fire Warden's 1929 Buick Squad Truck, Newhall. SD0100 - Newhall Sheriff's Office, ~1928-1930. HS9022 - Dam victims' bodies fill Newhall's Masonic hall, March 1928. TL2901 - Letter from Charley Mack to Fred Lamkin Authorizing Construction of House in Newhall, 7-16-1929. MO2901 - Travelers Kafe, San Fernando Road & 9th Street, 1929. AL2029 - Pacific Telephone S Telegraph Directory with Newhall Listings, March, 1929. JF3001 - Medicine Bottle from Newhall Pharmacy, 1920s-1930s. LW3329 - Detail from Aerial Photo Series, Downtown Newhall, 1930, Labeled. SZ3403 - Back Side of Soledad Hotel at Spruce and 9th Streets, 1930s. SW3002 - Newhall Grade, Color Poscard, ~1930. AP0735 - East Side of Spruce (Main), South of 8th, Early 1930s. RB0007 - Newhall Constable's Office on Market Street, ~1930. RB0004 - Prohibition: Newhall's Dry Squad (Multiple Views), ~1930. AP2822 - Market & Spruce, Snow in Winter 1931, 4 Views. AC3102 - Spruce Street & Standard Station, Downtown Newhall, 7-25-1931. SD0110 - Newhall Sheriff's Office, 1930s. SD0115 - Newhall Sheriff's Office, 1930s. LW2413 - Weldon Canyon on US-99, Newhall. Real Photo Postcard, 1930s. FD3301 - L.A. County Fire: 1933 White 600-Gal. Pumper in Newhall. SW3301 - Map Showing Location of Original Pioneer Cemetery, 1933 (Comparison to 1966). SW3302 - Map Showing Location of Lyon's Station, 1933 (Comparison to 1875). LW2125 - W.C. Fields at Home in Newhall (2 Views), ~1935. AP1535 - T.M. Frew & Sons Blacksmith Shop, 1936. FD3701 - L.A. County Fire: Assistant Fire Warden's 1937 Chevy Carryall Suburban, Newhall. AL1939 - Newhall Train Depot, 1939. DI4001 - Newhall 5-10-25 Cent Store, 1-14-1940. LW2122 - Bridge Over Southern Pacific Railroad, Newhall Grade, 1940s? FILM - Newsreel: Newhall Refinery On Fire, 1944. HS9021 - Newhall Refinery Explosion ~1944. AL1944 - William S. Hart Home, Newhall, ~1940s. JB4001 - Artifact: Newhall Dairy Farms Milk Bottle, ~1940s-50s, Found in San Francisquito Canyon 10-15-2013. HS1903 - Newhall Dairy Farms: One Quart Milk Bottle, ~1940s-50s. LW2894 - Newhall Dairy Farms: Half-Pint Milk Bottle, ~1940s-50s. LW3448 - La Cañada Pottery: Orange Dinner Plate, ~1930s. LW3447 - La Cañada Pottery: Small Green Pitcher, ~1930s-40s. LW3440 - La Cañada Pottery: Candle Holders (2), Uranium Orange, ~1940s. JS4620 - Newhall Girl Scouts, 1946. HS4701 - Handbill, Yankee Patterson Circus, 4-5-1941. AP1835 - Havenstrite Oil Rig, ~1949 (3 Views). AP2728 - Spruce Street, East Side, 8th to Market: M&N, Newhall Hardware, Safeway, more: 1948. AP2722 - Spruce Street, West Side South of 8th: Newhall Refining, Losier's, Horton's, more: 1948. AP2126 - Arcadia-Wayman Street Oil Boom, 9 Views, 1948-1949. HS4901 - Placerita Oil Field (Confusion Hill), 11x28 Poster, 1949. AP0833 - Placerita Oil Field (Confusion Hill), ~1950. LW3231 - Dedication of H.M. Newhall Memorial Pool (1949) and Park (1950). AL1943 - Newhall Pharmacy ~1950. LW2553 - Spruce & Market: Signal Gas, Newhall Pharmacy, Motor Stage Cafe, Etc. ~1950. DI5001 - Arthur B. Perkins at Work, Newhall Water Company, ~1950. AP1520 - First Presbyterian Church • Fellowship Hall, 1950s. SD0120 - Newhall Sheriff's Office, 1950s. SD0120a - Newhall Sheriff's Office (detail), 1950s. AL1950 - William S. Hart Residence, Newhall, RPPC Postcard, ~1950s. AL1958 - U.S. Forest Service, Newhall, 1950s. BH0300 - Dr. Sarah L. Murray's Office, 1950-52. AP1036 - Original Pioneer Cemetery near Lyon's Station (Pre-move), ~1950s. AP1037 - Sanford Lyon's Headstone in Original Pioneer Cemetery (Pre-move), ~1950s. LW2869 - Newhall Refning Co. Wall Calendar, 1951. BH5202 - Ralph Williams' Newhall Pharmacy, Interior & Exterior, 1952. 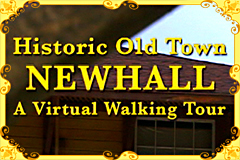 SW5201 - Old Newhall Jail, 2 Views, 1-10-1952. LW2047 - Newhall Oil Property, Aerial Photo, 1952. LW2048 - Newhall Oil Property, Aerial Photo, 1952. LW2049 - Newhall Oil Property, Aerial Photo, 1952. LW3094 - Newhall Pass: San Joaquin Daylight Approaches San Fernando Tunnel from South, 11-23-1952. LW2495 - Natural Gas Metering Station, 2 Views, 1955. HB1809 - Goodyear Tire, Soledad Hotel, Herald's Club, Placerita Liquor in TV's "Highway Patrol," 1955. RM5201 - Newhall Radio & Television Service Co., 1952-56 (4 Views). LW3522 - Photo Gallery: Perkins Building ("Red Signal Buildings") Under Construction, 6th Street, 1956. AP0826 - Newhall County Library Dedication, 11-18-1957. HG5705 - Newhall Ambulance Service, Late 1950s. MG5801 - Happy Valley, Looking Toward Future Valencia, Jan. 1958. FD5801 - L.A. County Fire: Station 73 Dedication, Newhall, July 1958. HS0733 - Newhall Flower & Gift Shop, 24319, San Fernando Road, 1958. HS0750 - Howdy Cleaners, San Fernando Road (2 Views), 1958-59. LW3347 - Personnel of Sheriff's Substation No. 6 (SCV), 1959. HS5920 - Mel Knagg's Union Service, San Fernando Road, 1959. HS5905 - Newhall Refinery, 1959. HS0732 - Vanasen's Auto Electric Service, San Fernando Road (2 Views), 1959. HS0748 - Newhall Paint, Newhall Appliances, Lorraine Cleaners, 1959. BH5902 - Installing Christmas Street Decorations, San Fernando Road, 1950s. LW2932 - Lagerberg's Union 76 Wholesale Distribution Business: Personal Toolkit Promo, 1950s-1960s. AP1521 - Pardee House as Pacific Telephone Business Office, 1950s or early 1960s. HS6001 - Mode O'Day Dress Shop, San Fernando Road (2 Views), 1960. HS0749 - Bamboo Cafe, 10th & Spruce Streets, 1960. HB1702 - Bamboo Cafe, 10th & Spruce Streets, n.d.
HS0749b - Street Signs: Intersection of 10th & Spruce, 1960. HS6115 - Mary Ellen's, San Fernando Road, 1961. HS6101 - Newhall Hardware, San Fernando Road, 1961. HS6105 - Newhall-Saugus Lumber, Valley Street, 1961. HS6120 - Powell's Richfield Service, San Fernando Road, 1961. HS6110 - William D. Ross, DDS, San Fernando Road, 1961. OLPH081361 - First Mass in New OLPH Catholic Church Location, 8-13-1961. AP1531 - Christmas Street Decorations, San Fernando Road, Early 1960s (2 Views). LW2133 - Souvenir Marshal's Badge, William S. Hart Park, ~1960s. HB6202 - Heavy Winter Storm Pummels SCV, January 1962. Photo: Walnut Street. SK6201 - Photo Gallery: Newhall and Castaic in the Snow Storm of January 1962. AP1009 - California Star Oil Guest House & Office, Pine Street, ~1962. AP1018 - Lassalle Ranch, Wiley Canyon, 1963. Abandoned SPRR Newhall Depot Burns Down; Chilly Hobos Blamed, 1-11-1963. OX6402 - Second First Presbyterian Church, Newhall, 1960s. Slippery Princess Homes: Anatomy of a Disaster, 1968-1969 • News Reports. HB6601 - 8 Aerial Photos: Hart High, Placerita Junior High, 7-10-1966. Lyons Ave. to Cross Train Tracks — in 1965, 1971, 1984, etc. • News Reports, 1967-2010. LW2937 - Newhall Ice Co. Ice Pick, 1963-1999. LW6901 - Golden State Memorial Hospital Advertisement, 1969. LW7002 - Postcard, "Greetings From Friendly Valley," 1970. LW2312 - Southern Pacific Passenger Train in the Snow, 12-19-1970. FD7001 - L.A. County Fire: Station 73, Newhall, 1970s. TN7301 - Plaza Theatre, Lyons Avenue, May 1973. TN7302 - Plaza Theatre & Newhall Bowl, Lyons Avenue, May 1973. TN7401 - Downtown Newhall in the Snow, 1-4-1974. HS7420 - Boys' Club Building (Pardee House) in the Snow, 1-4-1974. NH0100 - Newhall Hardware, 2-27-1976. HS7701 - Program Book: First Presbyterian Church Dedication Services, February 1977. LW2768 - Mama Toni's Italian Restaurant, Matchbook Cover, 1970s-1980s. LW2818 - Margo's Boutique, $25 Good-for Token, 1980s. BW8601 - (City Formation?) Meeting in Chamber Office (Pardee House), ~1985-1987. BW8705 - Downtown Newhall and Hart Park, Multiple Images, ~1987. TO8701 - Photo Gallery: Newhall Church of the Nazarene Under Construction, 1987. LW2102 - Downtown Newhall Walk of Western Stars Inductees, 1981-Present. LW2697 - Way Station Coffee Shop, 2 Views, Summer 1995. LW3140 - Creekview Park Groundbreaking, Newhall, 8-3-1996. LW2513 - Newhall Hardware 50th Anniversary Celebration, 7 Views, 8-16-1997. LW3136 - Railroad Avenue Improvements: Groundbreaking & Initial Construction, 9-24-1997. LW2180 - Pole Barn at William S. Hart Park, ~1998. LW3135 - Future Veterans Historical Plaza Site (Ex-Pardee House Site), 1998. LW2150 - Demolition: 24867 Walnut Street (A Bermite House). 8 Views, 1-6-2002. LW2151 - Demolition: 24713 Arcadia Street. 3 Views, 1-6-2002. SC0503 - Newhall Community Center Under Construction, 12/2005. Video - Demolition of Moore's Sub Shop, 24158 San Fernando Road, 7-11-2007. FD0801 - L.A. County Fire: Station 73, Newhall, 2008. SC1704 - "Criminal Minds" (TV Series) on Location in Newhall, 2011-2013. SC1303 - Newhall Roundabout (Traffic Circle) at Newhall Ave. & Main Street: Design Plan. SC1101 - Newhall Roundabout (Traffic Circle): Animation. SC1302 - Newhall Roundabout (Traffic Circle): Locator Map. SC1304 - Newhall Roundabout (Traffic Circle): Groundbreaking 7-23-2013. SC1301 - Newhall Roundabout (Traffic Circle) Under Construction, 7 Views, 8-15-2013. LW2485 - Newhall Roundabout (Traffic Circle) Takes Shape, 7 Views, 9-28-2013. LW2501 - Newhall Roundabout (Traffic Circle) Construction, 7 Views, 10-13-2013. Gallery - Marine Fossils, Newhall Creek (Placerita Canyon area), 7 Views, Collected 2014. LW3487 - Charley Mack House (1 of 3), 22931 8th Street, Multiple Views, 2019. HB1404 - Charley Mack House (2 of 3), 23021 8th Street, Multiple Views, 2009 & 2013. HB1403 - Charley Mack House (3 of 3), 23031 8th Street, Multiple Views, 2009 & 2014. LW2744 - Wildwood Sanatorium Cabin No. 11, Cross Street, Happy Valley. Multiple Views, 11-23-2014. TV1501 - Demolition of Insurance Auto Collision Center Bldg., 22520 Lyons Ave., Multiple Views, 3-9-2015. LW041615 - Stuntman Diamond Farnsworth Inducted Into Newhall Walk of Western Stars, Multiple Views, 4-16-2015. SC1504 - Shopping Center, 25810 Sierra Hwy. (Corner Golden Valley): Planning Documents, 2011-2015. LW2799 - Shopping Center Under Construction, 25810 Sierra Hwy. (Corner Golden Valley), 2 Views, 6-2-2015. Fire-damaged House, 24148 Pine St., to be Demolished • City Staff Report & Documents, June 2015. SC1703 - "Baskets" (TV Series) on Location in Old Town Newhall, 10-10-2016. LW2980 - Slated for Demolition: 24326 Walnut Street Residence, Multiple Views, April 2017. Lyons Ave.-Dockweiler Extension • Draft EIR, 8-16-2017. LW3281 - Lyons Oak/Lyons Stump at Placerita Nature Center, Photos 2018. SC1711 - Fallen Warriors Monument Unveiling at Veterans Historical Plaza, Newhall, 11-8-2017. LW3284 - Onetime Home of Child Actor Buzz Barton Torched in Fire Training Exercise, 4-22-2018. HS1803 - Historic Dance Hall-Morgue Piano Donated to SCV Historical Society, 2018. HB1831 - Park Newhall Apartments, Built 1959-1963 (2018 Sales Brochure). HB1820 - Rancho La Salle (Calgrove Area): Sales Brochure & Floor Plans, 1978. HB1818 - Oak Valley Estates (Happy Valley): Sales Brochure & Floor Plans, 1981. LW2763 - Kansas Street Townhomes Under Construction, 24514 Kansas St., 2 Views, 2-28-2015. SC1505 - Planning Documents: Affordable Apartment Units at 23610 Newhall Ave., 6-9-2015. LW2956 - Affordable Housing Units Under Construction, 23610 Newhall Ave., 4-1 2017. Three Oaks: Affordable Housing Comes to Santa Clarita, 10-19-2017. AP1017 - Historic Needham Ranch Structures, n.d.
LW2188 - Lunch on the Needham Ranch, 2 Views, 1914. John Olmstead's Live Oak Manor Cacti Gardens (Needham Ranch) • News reports, 1930s. HS0880 - Trash Dump Plan Thwarted as Cemetery Firm Buys Needham Ranch, April 1957. LW2153 - Needham Ranch Tour with Mark Gates. 9 Views, 2-3-2002. Gate-King Industrial Park: Community Benefits, Letter 9-14-2002. LW2425 - Gate-King Industrial Park Project Site Map (Needham Ranch), 2003. Gate-King Industrial Park: Final EIR, June 2003. Cal. Water Impact Network et al. v. NCWD, Gate King Properties, et al. : Appellate Ruling 5-13-2009. Trammell Crow, Clarion to Build Phase 1 of Gate-King Industrial Park, 8-17-2017. SC1713 - Phase I Groundbreaking Ceremony, 12-12-2017. LW3393 - Marketing Brochure: The Center at Needham Ranch, CBRE 2017. Video - Grading, Phase 1, Gate-King Industrial Park; Drone Video 6-18-2018. LW3392 - Rock Arch at Needham Ranch Moved, Again • 8-30-2018.